No, I don’t walk my baby in heels. He just hates to be left alone… all he wants is to be with us – how can you not love something that loves you THIS much? We’re so crazy about this little fella. One of my favorite looks – jeans and a blazer. Speaking of LOVE for dogs, I just picked up this little cutie-pie from our local shelter. She’s for my son, who’s promised to love, honor, and obey this little gal. 😉 Her name is Maya. She’s such a sweetie! get too busy and I didn’t want her to think poorly of them. i’m sure maya and your son will be happy together. maya is so a sweatie! I agree! Tobi is a super model! You make me wanna run down to the shelter!!!! Jeans + blazers is my go-to combo for work…other than my pencil skirts! It’s casual but polished. Maya is a cutie…do you know what kind of dog she is?! So glad she rescued you! I totally agree with you about jeans & blazers. The shelter has Maya as a Boxer mix. We think there’s a Shepherd or a Lab in her as well. I suppose it doesn’t matter b/c she’s the cutest & sweetest mutt ever! Maya is officially melting my heart. So cute. There’s nothing like a pet to grounded, in love and speak in a silly baby voice! My very old dog still gets that puppy look in her eyes when she tosses her toy around. Congrats to your son. Jeannie! You look great! Love the pics on the golf course and Tobi! 🙂 And your son is so lucky to be getting sweet little Maya! Tobi is a natural…..he should be a doggie model! Great outfit! Fabulous pups! Welcome Maya! You’re a lucky puppy! I’m sure there’s a perfect doggie just ready to save you! And, they are so much easier than kids! I love your shoes ! They make me crazy ! Yes, he’s my third child! You look stunning (as usual) ! And your dog is the cutest thing I’ve seen ! I’m glad to hear from you, sweetie! Yes, Tobi is a happy fella! Maya is beautiful. I’m sure your son will adore her. Dogs are the best friends, aren’t they? Maya stole his heart the moment he saw her! I spent one day with her, and I miss her already! LOVE blazer & jeans! 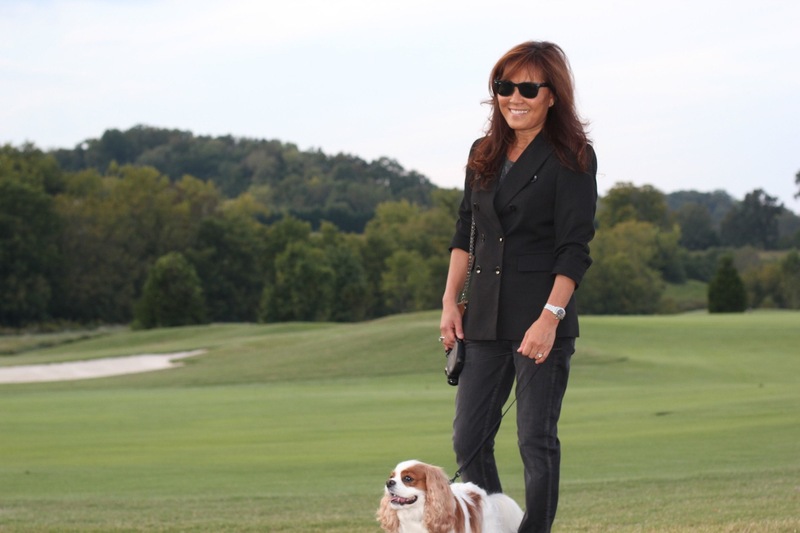 Walking your dog – you’re looking like one hot momma! As usual, you look great. There is something so chic about a blazer and jeans and you pulled it off. Congrats on your son’s adoption of Miss Maya! She is too cute and I’m sure she will be loved beyond measure! Yes, my son’s very blessed to be loved by Maya and vice versa. What a tear-jerker! I am so glad you rescued Maya; your son will love her I am sure. Our little Tito the Cat likes to be with us wherever we are too. We rescued him or he rescued us – I am not sure which! 🙂 You look fab! I love that poem! And, SO true! My son came up today to pick her up. He LOVES her already! She is really really sweet and loving. Awww… Maya is so darling! She reminds me of mine when I tried adopting one from a classmate. Oh, so sad! Those puppy eyes can be deadly. Tobi pretty much knows how to get what he wants from me. He’s a genius manipulator! Do you have a pet now? I hear having a pet is good for your health! Beary is a cutie! God bless you for adopting and taking cared of Rani. So glad she’s okay now. What a good mamma you are! What a fashionable li’l guy! I love it when bloggers share four-legged pics. That’s a real cutie going to live with your son, too. Love your heels. I wish I could wear mine that high, but I can’t. Tobi’s pretty much a constant accessory in my photos and ON my wardrobe. Yes, my son is in heaven. Maya is just so sweet and loving. It will be fun to watch how he handles the responsibility of caring for another being who’s so dependent on him. So nice from you to rescue the adorable Maya! Looks like she will be a happy dog, just like yours. 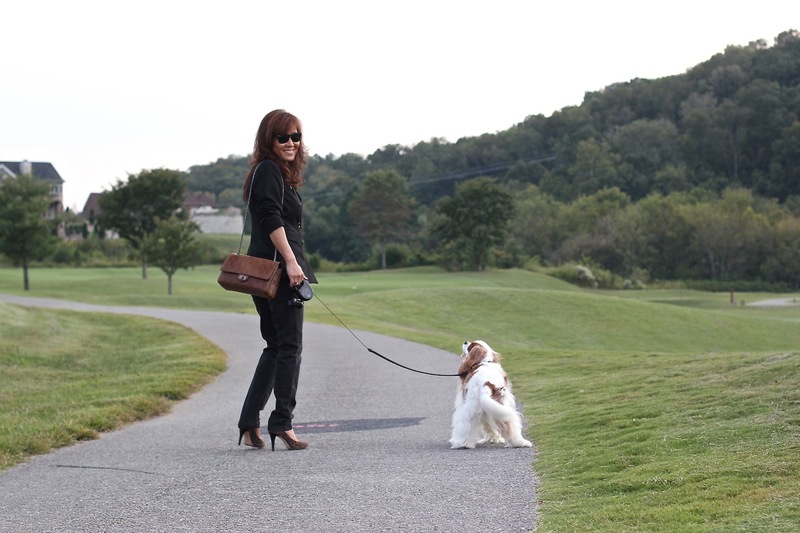 You are lucky to be able to walk your dog with heels! Ours is a cute lab – our third kid in a sense… But she is so strong that flat shoes are mandatory when I go outside with her… Jeans, white shirt, scarf: this is my favorite walking-the-dog outfit…. Walking the dog, yes. Looking like a “rag” NO WAY! Tobi tends to pull me when we walk as well. I hate it b/c it pulls her collar around her neck. I was thinking about getting a chest harness, but that doesn’t solve the problem of him pulling when we walk. Thanks for the info! Maya has a sweet disposition….so loving! My son loves her! I’m sure you look ultra chic walking your dog in jeans, white shirt and your gorgeous scarf! I am in love with our little rescue dog too. And like your little dog, Rockefeller loves to be with us wherever we go. I hate leaving him to alone during the day–which can not be avoided at times, obviously. I have been completely surprised by the devotion we get from this dog. Can you imagine your life without Rockefeller? They are AMAZING companions. Noooo, I do not walk Tobi in heels. I love heels but not that much! sniff…sniff… loved the rescue a human story. Your doggie is so adorable and Maya is just too cute!! I know….I kinda cried, too. Maya is a sweetie! My son fell in love immediately when he saw her, just like I did! I love your doggie…so cute. Also love your outfit. Very stylish. Great concept in that poem! I got my two gorgeous cats from a neighbor who found them in her yard as kittens and it is so true that pets really save us–they make us laugh on bad days and keep our hearts engaged when they might otherwise take shelter, and fully bring the best out of us. They make our children more loving and kind. They give purpose to lonely people. And leave their white fur all over our black blazers, pants and anything else with a good contrast, just so we don’t forget. Perfect! I need the cat hair version of that. I just love this story 🙂 and I’m so happy you have a new member in your household! The proud owner of two dogs myself, I’ll tell you that it’s lots of fun.. never a dull moment. .. and I’m also loving those pumps, jeans, and blazer! Well, my grown on came home today and picked up Maya….he lives 2 hours away….I miss Maya already! Great shoes! Cutie pie dogs. Hello Maya! I’ve never picked up a new family friend from any place other than a shelter. Our latest lil’ guy is a rescue handicap pit bull. He is amazing! Thanks for sharing your story and love for shelter animals too. If I didn’t have to work (come on retirement!) and had unlimited income, I’d open a home for dogs and adopt all the dogs I could physically handle. I can’t imagine a life with out our little fur-kids, can you? It’s really wonderful that you rescued a handcap dog. Really, ’cause I too want to do that. If you look at the post, On Your Birthday….Wear a Tiara, you’ll see our rescue pit. So dang cute! Oh, I so agree with you about dogs…they are AMAZING!